Diabetes affects in excess of 29 million people in the United States and 10.9 million of them are age 60 or older. Caring for someone with diabetes requires a certain level of vigilance to ward off possible complications of the condition, such as damage to the feet, skin problems, nerve damage, and damage to the cardiovascular system. If your parent has diabetes and is receiving senior care, there are certain things that caregivers should do every day in order to keep your parent as healthy as possible. One of the key components to maintaining health for diabetics is eating a healthy, balanced diet. If possible, senior care providers and family caregivers should ensure your parent eats at the same times every day since it will help to regulate blood sugar levels. Also, your parent should not skip meals since that can cause blood sugar levels to drop. If your parent has worked with a dietician or medical provider to develop a personalized meal plan, it’s best to stick to the plan as closely as possible. In addition to eating well, your parent should also drink plenty of fluids throughout the day. 2. Monitor and Log Blood Glucose Levels. Your parent’s blood glucose levels should be monitored according to the doctor’s instructions. What is considered a “normal” level for your parent will depend on several factors, such as age, other conditions that are present, and how long your parent has had diabetes. Senior care providers and family caregivers should assist your parent with keeping a log of blood glucose levels. The log should also include other information about your parent’s diabetes care plan, including medicines taken, exercise, foods eaten, etc. Keeping a log will be helpful in determining how well your parent’s care plan is working. Proper foot care is essential for diabetics since infections in the feet may spread to the bone. Since seniors are often unable to care for their feet themselves, special care should be given to keeping toenails trimmed to prevent ingrown toenails. Senior care providers should inspect feet every day, checking for cuts, calluses, ingrown toenails, warts, and fungal infections. If any of these are present, talk to your parent’s doctor. 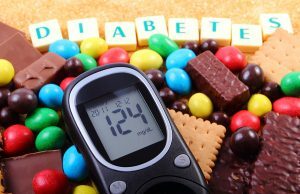 Diabetics are prone to oral health problems. They are at a higher risk for gum disease, dry mouth, and fungal infections. To prevent oral health problems, your parent should brush after every meal using a soft-bristled toothbrush. They should also floss daily. Physical activity helps reduce blood glucose levels. The American Diabetes Association recommends half an hour of aerobic exercise five times per week. Aerobic exercise is any exercise that raises the heart rate, so it includes walking, jogging, biking, swimming, or even just playing with grandchildren. In addition to aerobic exercise, your parent should engage in some sort of strength activity twice per week and balance exercises three times per week. Stretching is also important since it will help keep your parent flexible and reduce or prevent stiffness.